In recent years, Servicios Recipe Tm2 has invested over 3 million euros, to improve its facilities, automated equipment production and ICT systems. The company is a leader in protective packaging. The I+D+i investment is essential to the company, and it enables us to continue to offer competitive and advantageous prices. Tm2 has patented a new product of folding packaging, Quick Packaging®, providing the possibility of standard models, always in stock. Our Technical Department carries out specific studies according to the needs of each project, to propose the best logistics options to our clients, while maintaining complete confidentiality. These progresses provides added value to our clients with innovative, high quality and economical solutions for each project, becoming a new step in the supply chain. With more than 25 years’ experience in industrial packaging, our company´s knows-how has positioned us at the forefront of the industry since our inception. We focus on quality of services and security. We specialise in units packaging for the logistics process KD (CKD, MKD and SKD) for the automotive industry, from receipt (including verification pieces), to packaging and shipment, including packaging lists and deliveries control. Beatriz Jiménez Marketing Manager, Alejandro Navarro Supply Chain Manager, Mónica Jiménez Assistant Manager, Manuel Valero Plant Manager y Alfonso Santa Isabel Sales Manager. 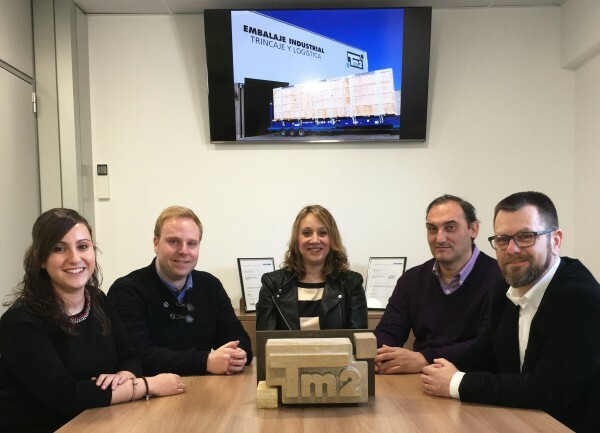 In the last few years, Tm2 has developed internationally, and has set up a manufacturing plant of wood packaging in Mexico (6.000 m2 surface and 20 employees). We have also extended our presence around Spain and Portugal, through Partners and Joint Ventures. Our General Manager, Miguel Ángel Jiménez, focuses on staff training and has a young management team with extensive sector knowledge. The company continues to explore its expansion worldwide. The efforts of our entire team was reflected in 2015, with an increase in turnover of 25%.